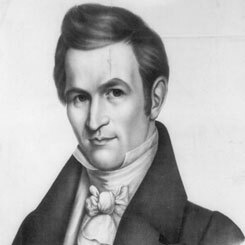 Image courtesy of Library of Congress Elected to the 25th Congress (1837–1839), Jonathan Cilley of Maine served less than one year in Congress before being killed in a duel with a fellow Member. On this date, Jonathan Cilley of Maine was killed by Representative William Graves of Kentucky in a duel on the outskirts of D.C., in Prince George’s County, Maryland. Graves approached Cilley with a letter at the behest of a newspaper editor, James Webb, who was incensed about a bribery accusation Cilley had made on the House Floor. Cilley refused to accept the letter; Graves interpreted the refusal as a direct insult to his character and challenged Cilley to a duel. In an ironic twist, neither man had any known grievance with the other prior to the incident. With two other Members of the House present, Henry Wise of Virginia and Delegate George Jones of Wisconsin (the dueling seconds for both men), the duel went beyond the customary two rounds, resulting in Cilley’s death in the third round. After the ensuing House investigation, Graves, along with Wise and Jones, were recommended for censure after Cilley’s death. Although the House refused to impose the censure recommendation it offered a bill to “prohibit the giving or accepting within the District of Columbia, of a challenge to fight a duel, and for the punishment thereof.” On February 27, 1838, the House Chamber hosted a funeral, attended by the President Martin Van Buren and other statesmen, to honor Cilley.